At Martin Hill Inn, experience a comfortable and unique alternative to the hotel chains in town or near the outlets in Kittery, ME. This large, formal, Federal-style bedroom in the Main House of our bed and breakfast in Portsmouth has a queen-size canopy bed with English bed dressings. The room is named for the clipper ship, Cathedral. Launched in 1855 and weighing 1650 tons, Cathedral was a magnificent vessel. She carried passengers in her luxurious staterooms and transported over $260,000 worth of cargo. In 1857, she was tragically shipwrecked in a violent storm off the coast of Cape Horn. Cathedral’s builder, Samuel Badger, continues to lives on in name on Badger’s Island, which sits in the middle of the Piscataqua River separating Portsmouth, NH from Kittery, ME. Step back in time a bit on the original wide-pine-board floor from circa 1820. 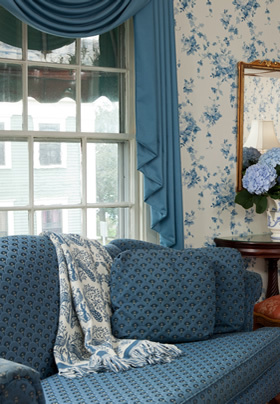 Other antique furnishings in this room include a large mahogany English armoire and a mahogany writing table with a centennial series chair, completing the feeling of being in old Portsmouth. The sitting area with an upholstered camelback loveseat and wingback chair beckons you to sit and read or relax awhile at the end of the day. 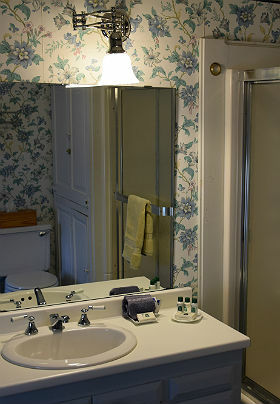 Providing lodging just 50 minutes from Kennebunkport, this room has our largest en-suite bathroom with tub/shower. It is located on the second floor of the Main House. The stairs leading to the second floor rooms, especially in the Guest House, are fairly steep. For guests who have trouble with stairs, we suggest booking a room on the first floor. Amenities: Queen Canopy Bed, Complimentary Wi-Fi, Flat-screen TV, Private Bath with tub/shower, Air Conditioning, End-table Refrigerator, Sitting Area with Armchair & Loveseat, Bottled Water, Sherry, Chocolates, and Snacks. “We have been visiting the Inn for many years. Always stay here. Great breakfasts and comfy rooms. Would recommend to all our friends.” Bruce & Patty, Pennsylvania.